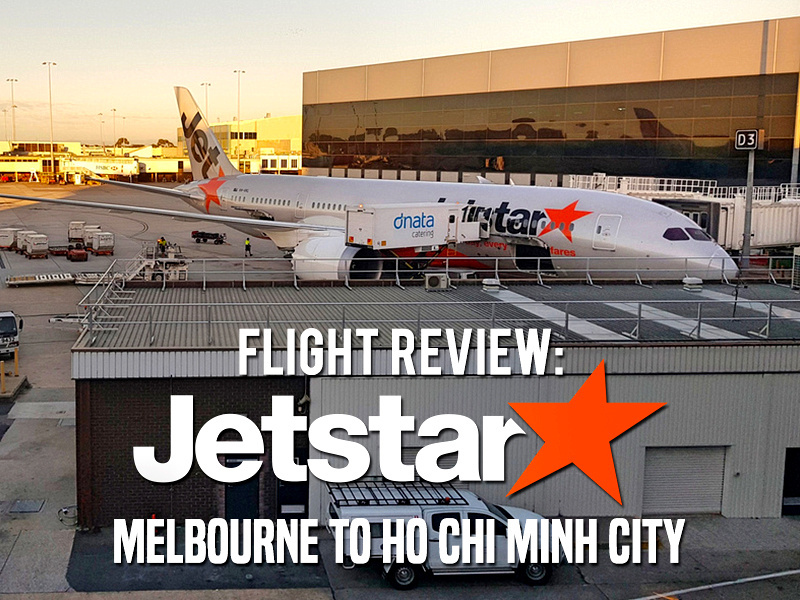 I flew with Jetstar from Melbourne to Ho Chi Minh City. As I am based in Saigon and Melbourne is my Australian home city I was happy to see this service when it began in May, 2017. Previously the only direct service has been with Vietnam Airlines. I compared fares on Skyscanner just to make sure which airline had the cheapest flight, and Jetstar had the better offer. 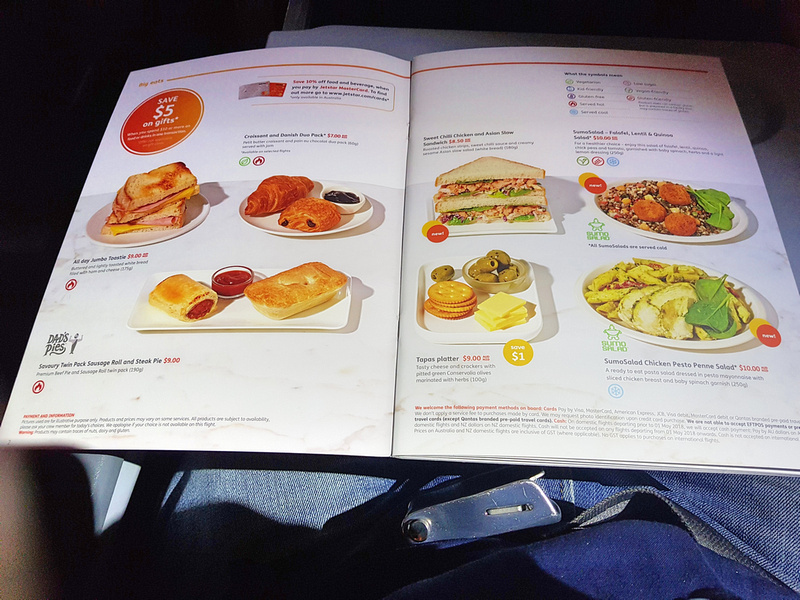 The promotional flight price was $249, plus I added a bag for $32 and a meal for $12.50, so the total was $293.50. 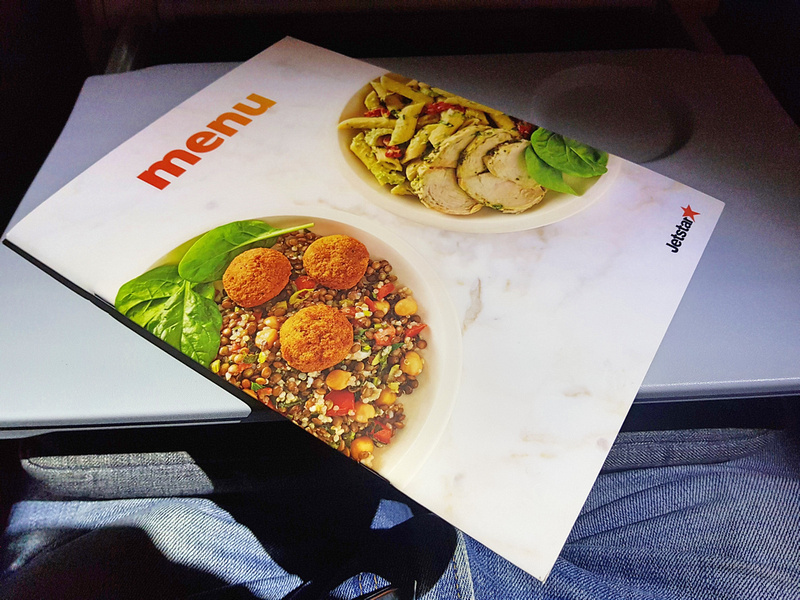 During the booking process you can select if you want to order a meal, and you can choose a post take-off or pre-landing meal. I picked the pre-landing meal and reminded myself to eat before flying. The good thing about this flight is that it flies during the day. The flight departs at 15.15 and arrives in Saigon at 21.05, making the scheduled flying time 8H, 50M. This is an ideal flying time for me as I prefer not to take the overnight flights. If you are coming back to Melbourne on the return flight then you do have to take the overnight flight. 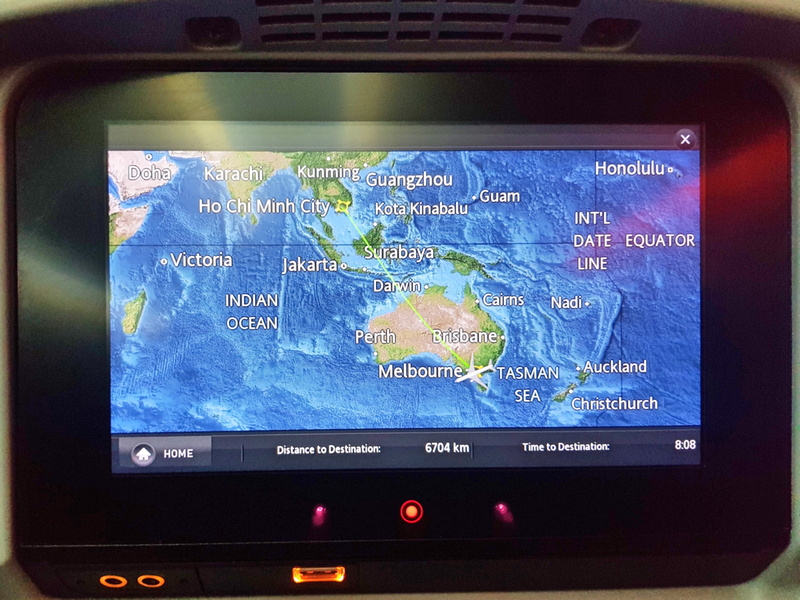 I ended up taking the day flight from KL with AirAsia to get back to Melbourne. 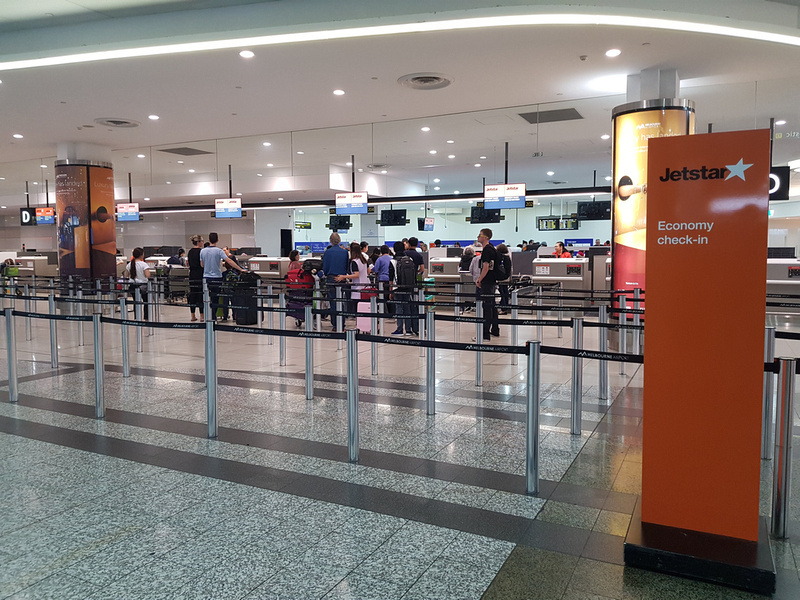 There was no online check-in for this flight as visas need to be checked at the airport. I was at the airport early, as is my custom, and the check-in was open well before the usual 3-hour opening time. I was worried about not getting an aisle seat, so I ended up booking one the day before the flight. I had lunch and coffee at the airport while waiting for my flight. 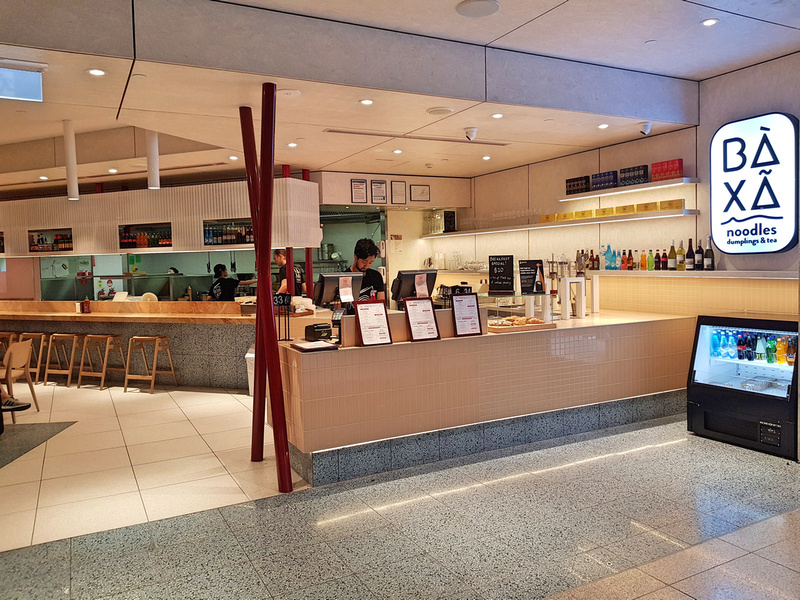 There is also a new Vietnamese restaurant called Ba Xa Noodles at the airport, continuing the trend of cool Vietnamese restaurants in Melbourne. 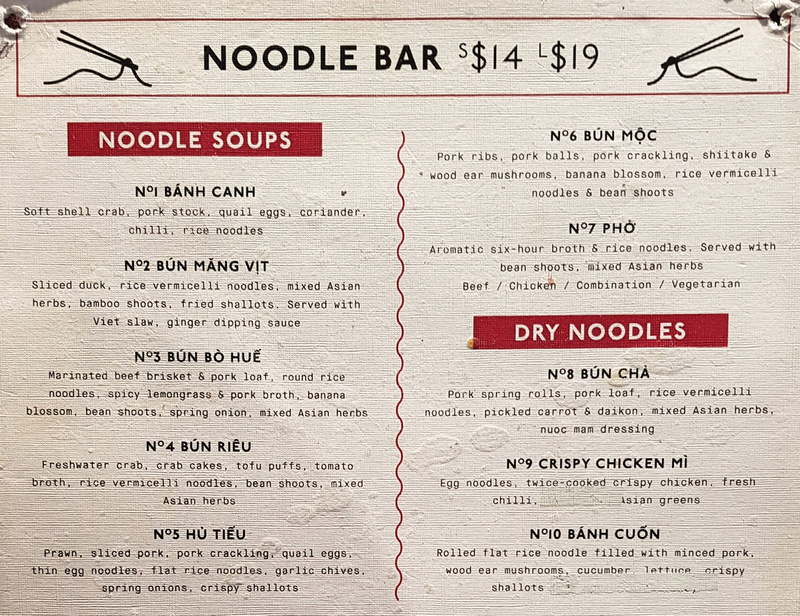 I was amazed to see that they have bun rieu, hu tieu, and bun moc on the menu. I gasped at the prices, but it is reasonably for Australia. If I was flying to any other place in the world apart from Vietnam I would have eaten here. 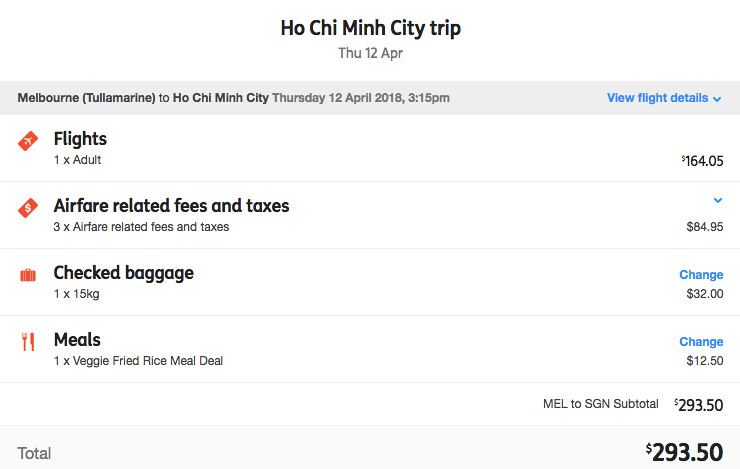 It didn’t seem right to have a $14 hu tieu when I was about to have a $2 one. Next time I’m at Melbourne airport I will go. I opted for an $8 meat pie instead as that seemed like the most Australian thing I could have before leaving my homeland again. After lunch I saw that the flight had been delayed, and it ended up being delayed for four hours. Urgh. It turns out there was a mechanical issue so they had to source another aircraft. It was impressive that they had a spare 787 available, and at the end of the day I would rather an airline that takes an aircraft out for maintenance. I’m only in Melbourne once a year these days, and I used to think Melbourne had a great airport. Perhaps when I was living here going to the airport was associated with an adventure. These days though I see how cramped the layout is. 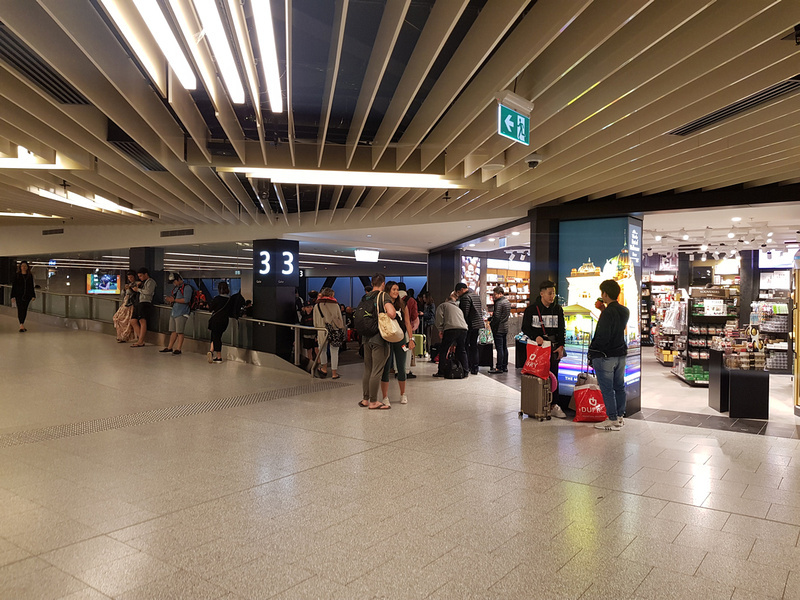 The gate for this flight was overflowing with passengers into the terminal hall as there weren’t enough seats inside. 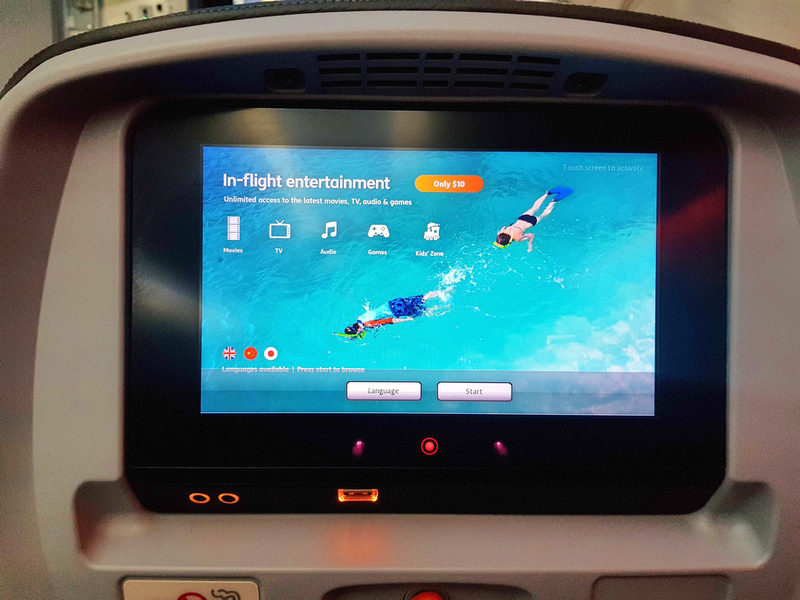 The flight was on a new 787, which I have flown a few times now but the size of the windows still delight me. 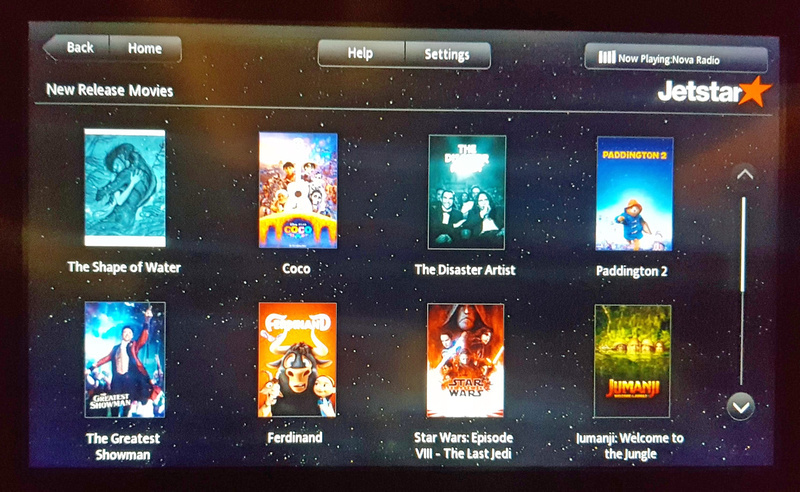 I was also surprised to see that there are inflight entertainment units. 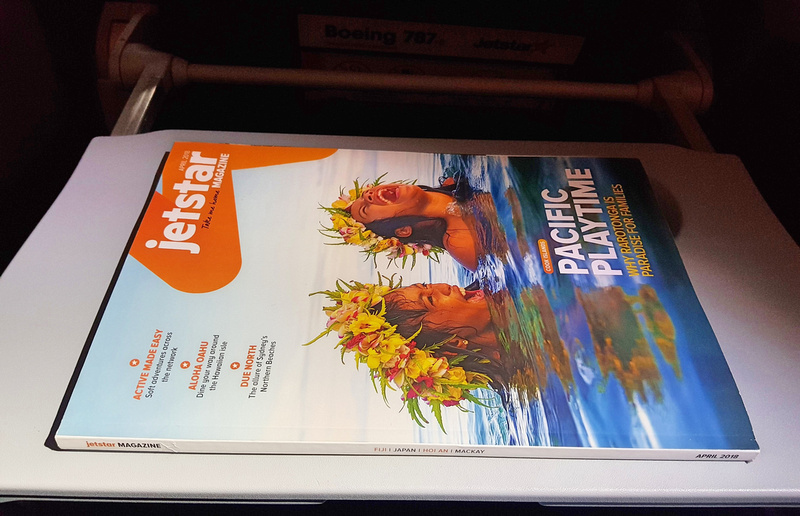 The last time I flew Jetstar to Melbourne they had tablets to rent. You still have to pay of course, but I like that the opton is there should the mood arise for a movie session. I just liked having the screen for the route map feature. You can also plug in your device here to charge up. There is also a power outlet under the seat. I planned to do a few hours work and but my new laptop has enough charge for a long flight. 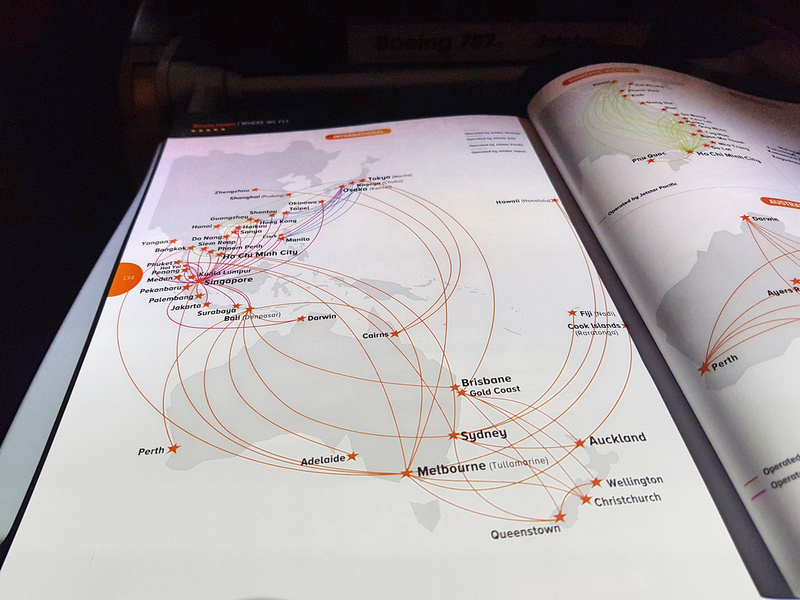 Jetstar Magazine – the inflight magazine of Jetstar. 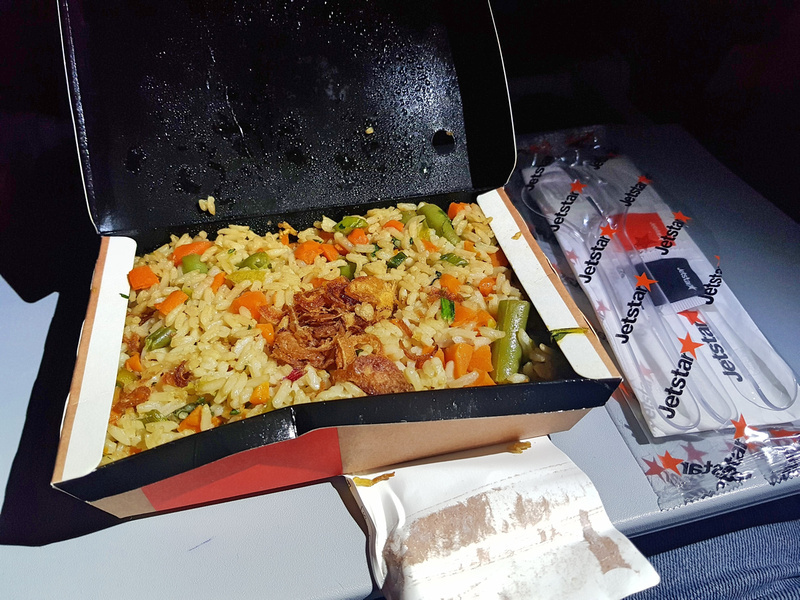 As Jetstar runs on the low cost airline model there is no free meal service. You can book in advance as I did, or buy onboard. I came prepared with snacks, but I still like to check. They also have a big vegetarian-friendly section. 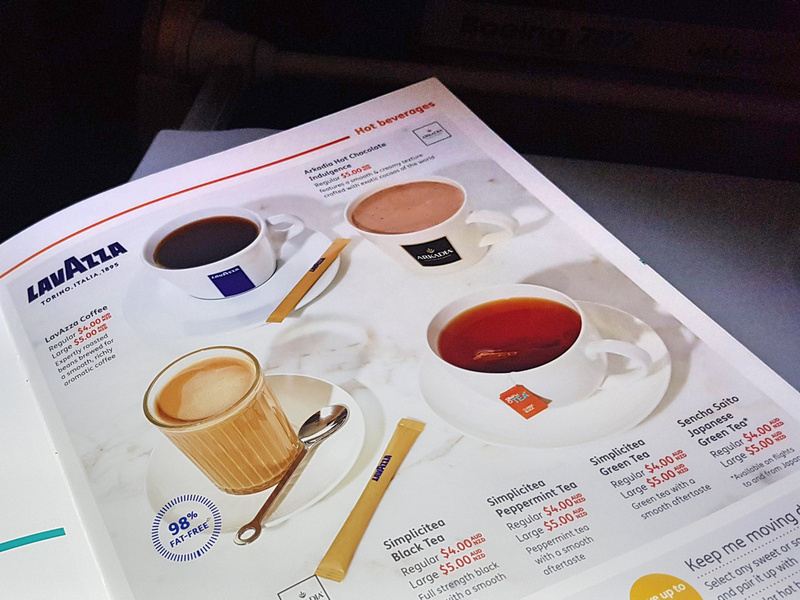 A tea or coffee is $4. I had to laugh at the presentation in the menu, which made it look like you are at a cafe. I didn’t see a disclaimer that says “pictures shown are for illustration purpose only”. When the second meal service came out before arrival I got the vege fried rice meal. The flight arrived just after midnight, 3 hours behind schedule. 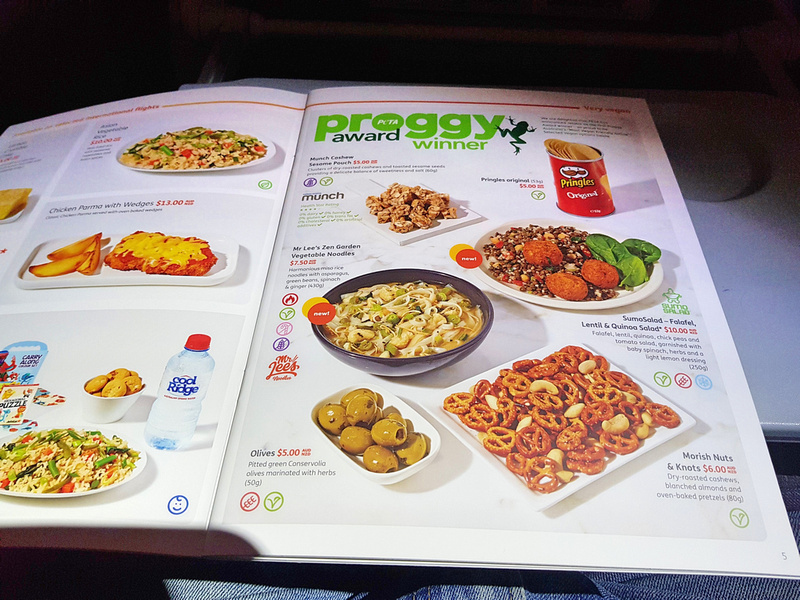 Apart from the delay it was a good flight, and I would take this again if I’m coming back from Melbourne to Saigon.